Criminal Minds spoilers are below, guys. Criminal Minds has gone through a lot of changes over its eleven seasons on CBS, and one of the biggest happened only last week when Shemar Moore ended his run as Agent Derek Morgan. Morgan was such a fixture on Criminal Minds that it’s difficult to imagine the show without him. Luckily, the hit drama is bringing back a familiar face by reuniting Emily Prentiss with her former unit, and according to showrunner Erica Messer, Prentiss is the perfect character to kick off the recovery period for these characters who have just said goodbye to Morgan. She’s sort of delicate about it at first, but then it becomes the ‘elephant in the room’ that they talk about. She can look at it from what Morgan must be feeling right now, because she was once Morgan. She decided to walk away, so she knows what that is. We tried to bring all of that to life. By the end of the episode, it’s a lovely look at ‘Here’s what happens when an old friend comes back.’ It’s laughs and a lot of love. 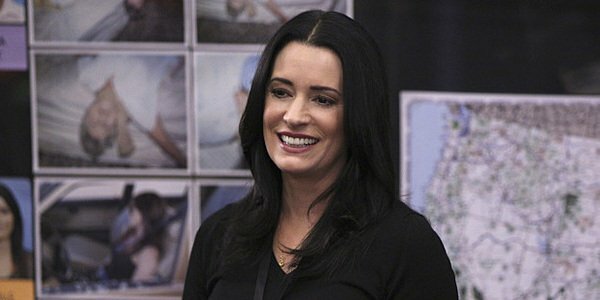 Bringing back Paget Brewster for a guest role in the wake of Moore’s departure is a great move by Erica Messer to soften the blow of the shakeup from Morgan’s grand (and thankfully non-fatal) exit. By revealing how Prentiss will fit back in to the team in her chat with TVLine, she promises that the episode will likely feel like as much a blast from the past as possible after last week’s game-changer. Prentiss showing up to help catch a killer with her old pals is really perfect timing. Her guest appearance will be the second time that Paget Brewster has reprised the role of Emily Prentiss since leaving the show as a regular in Season 7. She popped back in for the 200th episode in Season 9, but that’s been it for Prentiss. Of course, considering Brewster’s experiences toward the end of her tenure on Criminal Minds, it's hard to blame her for electing to focus more on her new Fox series Grandfathered than continue to show up on CBS. According to Brewster, the network juggled the female actresses and then more or less forced her to stay longer than she would have liked, and it left her with a “scummy” impression. Luckily, however, her memories of her time with the cast and crew of Criminal Minds are much sunnier, and she’d already expressed a willingness to come back for an arc when actress A.J. Cook had to take a break for maternity leave. It was only the success of Grandfathered keeping Brewster busy that stopped an earlier return of Emily Prentiss. Considering how beloved Prentiss was during her tenure on Criminal Minds and the killer ratings from the latest episode, we can bet that an awful lot of viewers will be tuning in for Paget Brewster’s big return to help address the Derek Morgan situation. And whatever that serial killer business is. To see Prentiss back in action, don’t miss Criminal Minds on March 30 at 9 p.m. ET on CBS.